The characters, apart from the kittens, belong to Tolkien. No money is being made from this story. 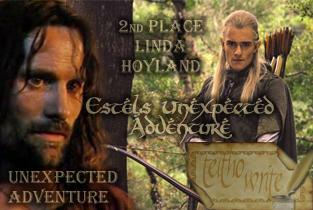 Written for the Teitho “Unexpected Adventures” challenge where it was placed second. This is the 1000th story submitted to the Teitho challenge. Estel laughed as the kittens wrestled and pounced. He dangled a bunch of chicken feathers on a stick in front of his especial favourite, a ginger and white boy. It gazed at him unblinkingly with bright green eyes before pouncing on the toy. “Don’t they have cats in the Shire?” Estel asked curiously. Estel turned his attention back to the ginger and white kitten, which scrambled on to his lap. The mother cat was lying the centre of the lawn, half- heartedly washing the patchwork coloured kitten’s ears while two brindle- coloured kittens suckled from her. “I asked about your lessons, Estel,” Gilraen persisted. “I don’t see what they have to do with us,” Estel said rather crossly. The kitten was started by his change of tone and darted away back to his mother, who began to wash his ears too. Gilraen’s face grew grave. “When you are older you might well have adventures,” she said solemnly. “I will,” Estel replied, but Gilraen was already out of sight. Estel continued to play with the ginger and white kitten, while keeping a close eye upon the others. The two brown kittens eventually fell asleep, while the patchwork one continued to explore. For a while, she was content to wander around the lawn, sniffing at anything that took her interest then she started to wander off making her way towards a path that led to the woods. Estel called her back, but she ignored him. He gently put the orange and white kitten from his lap and leapt to his feet. He followed the kitten down the path, hoping she would not disappear into the undergrowth. He tried to catch the little creature, but she was far swifter than he was and determined to outrun him, thinking he was playing with her. Eventually, she stopped at the base of a large oak tree to sharpen her claws. Estel prepared to catch hold of her, but she clambered up the tree. Despite being young and not all that steady on her feet, she managed to evade Estel’s grasp, lashing out with needle sharp claws. She continued to clamber up until she reached a high branch. Then she stopped and began to mew pitifully. Estel called to her to come down and held out his arms, but she seemed too frightened to move. He sighed. He would have to climb up the tree to fetch her. He loved climbing trees, but his mother had said he should only do so when he was wearing old clothes. He was dressed in the tunic and breeches he usually wore for lessons and Gilraen would surely scold if he damaged it. Still, she had told him to watch the patchwork kitten! Nimbly, he climbed up the tree until he reached the kitten. He managed to grab hold of her and descend the oak with her in his arms. As soon as they reached the bottom, she wriggled free and ran off at great speed. Estel could only try to keep up as she scampered along the woodland path. The boy ran after her. She was moving more slowly now. Surely, he would catch her soon. The kitten had other ideas, though and remained out of reach. Estel raced after her until they reached a clearing. There was a deserted summerhouse there. Estel recalled that Elrohir had once told him that the summerhouse had belonged to their mother and fallen into disuse since she had sailed away. The door stood open and the kitten darted inside. Estel smiled. At last, he would be able to capture her. He followed her within. The spacious interior of the summerhouse was covered in a thick layer of dust. It was furnished with two chairs, a small table, and a couch devoid of most of its stuffing. The kitten leapt on one of the chairs. Estel tried to grab her, but she dived away from him. He chased her around the room, catching the door as he did so. It closed with a resounding thud. The kitten leapt on the table and Estel finally caught her. She purred in his arms and immediately fell asleep. Vastly relieved, Estel grinned triumphantly. He hoped he could return with the kitten before anyone noticed she was missing. His hand reached for the doorknob to open the door. It came away in his hand. Estel was annoyed. He would have to put down the sleeping kitten in order to open the door. No doubt, she would wake up and escape again. He did not want to spend all afternoon chasing her when he could be playing with Kuluino. He would have lessons for most of the day tomorrow and be confined in Master Elrond's study. The kitten squeaked indignantly as he placed her on the floor. She then moistened a tiny paw and began to wash behind her ears. Estel gave the door a push. Nothing happened. He pushed again, harder this time, again with no result. The door was well and truly latched! He began to feel scared and called out "Help, help!" There was no answer. But who would hear him deep in the wood? The dust was so thick it looked as if no one had been here for years and years. Estel now remembered Elrohir telling him that it made his father sad to come here since Lady Celebrian had sailed. He was truly frightened now. He was trapped. What if no one ever found him? He might die here all alone. And the poor kitten! She would starve too. He looked around for some other means of escape. There were several windows, which let light into the building, but they were far too small for a boy to climb through. At least the kitten could escape if he broke one. Maybe she would find her way back to her mother. She gave another mew that sounded more like a squeak and started to wash her paws, purring as she did so. Estel was loth to put her out of the window just yet. He sat down on the floor beside her and she clambered on to his lap and promptly fell asleep again. Estel's spirits sank lower with every moment that passed. He was thirsty and starting to get hungry too. He had learned in his history lessons about people who died of hunger during the Fell Winter and it sounded a horrid way to die. He felt like crying but told himself sternly that he was almost grown up now and was too old for crying. Nevertheless, tears trickled down his cheeks. One woke the sleeping kitten, which gave a pathetic surprised squeak before closing her eyes again. She started to purr and the sound soothed the distressed boy. Estel drifted off to sleep too. The shouts outside woke the sleeping boy with a start. It was almost dark outside. For a few moments he was confused. Why was his bed so hard? The kitten jumped up and started to scratch frantically at the door. From outside came a loud urgent mewing. "Estel!" the voice called again. The boy recognised his mother's beloved familiar voice. "I'm here!" he cried. "The door knob broke off." "We will soon get you out,” called another voice, this time Elrohir's. "My brother has gone to fetch some tools." "Are you hurt?" called Gilraen. "No, I just don't like being shut in here," said Estel. "The poor kitten is scared." Gilraen and Elrohir talked to him and it seemed only moments before he could hear the sound of Elladan forcing the door. Gilraen pushed it open and Estel ran into her arms, not caring that he wasn't a baby any more. He was trembling as he hugged her tightly. The kitten ran to her mother and promptly started suckling. "How did you find me?" Estel asked after a few moments. "You can thank the mother cat," said Gilraen. "We soon realised that you and the kitten were missing, but we had no idea where you could be, but the mother cat kept mewing for us to follow her and led us here." "I'm sorry," said Estel. "I did try to watch Master Bilbo's kitten, but she ran off and then the door banged shut and the knob came away in my hand. I didn't mean to cause any damage nor get my clothes dirty." "No one is angry with you, son," said Gilraen. "You tried your best to watch the kitten." "We have decided to leave her with her mother for a few more weeks before taking her to Master Bilbo," said Elrohir. "The poor Hobbit might find her too adventurous at present." Estel suddenly brightened. "I've had a real adventure today, haven't I?" he said. "You have indeed," said Gilraen, “and doubtless given me quite a few grey hairs as result! Now come, it is long past suppertime and I expect you are hungry. We have brought the horses so you can ride home." All the way back to the Last Homely House, Estel smiled, imagining himself as a great adventurer astride a war charger, clad in shining armour and wielding a great sword as he rescued kittens from Orcs and dragons. He had had an adventure. Who knew what might come next?